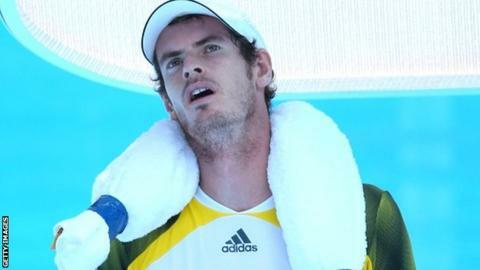 Andy Murray and Laura Robson will face demanding conditions as temperatures are expected to soar at the Australian Open on Thursday. Forecasts are for temperatures close to 40C and Murray will experience the worst of it when he plays Joao Sousa. The British number one is scheduled in the second match on Hisense Arena at approximately 02:00 GMT (1pm locally). Robson faces former Wimbledon champion Petra Kvitova in the second night match on Rod Laver Arena, around 9pm locally. Murray, 25, swept aside Robin Haase in round one and should not be delayed too long against Portuguese Sousa, the world number 100. "I don't know too much about him, but I've seen him play a couple of matches during the clay-court season last year in Barcelona," said the Scot. "I also saw him a little bit at the French Open as well." Talking before the order of play was announced, Murray was asked about the prospect of being scheduled in the heat of the day. "Preferably when there's a bit of shade on the court in temperatures like that, it obviously helps," said Murray. "For a majority of the day, it's going to be tough conditions to play in and I need to be ready for it." Sousa has played most of his career on the lesser Challenger Tour, and admitted he is likely to find Murray too powerful. "He's one of the best players in the world," said the 23-year-old. "He showed that, he won a lot of big tournaments. He's a very strong player. "And weaknesses? I don't know if he has it, but I'll try to find it. He looks to be in very good shape and probably had a vey good pre-season and feels confident about this match." If Murray is an overwhelming favourite for his match, Robson is less of an underdog in hers than the statistics might suggest. Kvitova, 22, is the eighth seed in Melbourne and was as high as second in the world this time last year. However, her powerful attacking game - to which fellow left-hander Robson's is often compared - is unpredictable. "We're both lefties and I think, in general, lefties tend to have a certain game style, and certain patterns, just because it works that way," said Robson, ranked 53rd. "But I would say there's quite a lot of differences as well." And while admitting she does not enjoy the heat, Robson hopes that past experiences in places like Hobart and Palermo will stand her in good stead. "There are going to be some iced towels on court for sure. I think it's going to be tough for everyone on Thursday but you've just got to try to get through it," she said. Robson and Kvitova will follow the opening night match between Roger Federer and Nikolay Davydenko, which starts at 08:00 GMT. Defending champion and top seed Victoria Azarenka opens the day on Rod Laver Arena against Eleni Daniilidou of Greece at 00:00 GMT, before five-time champion Serena Williams takes on Spain's Garbine Muguruza. Wimbledon doubles champion Jonny Marray teams up with Brazilian Andre Sa against Slovakians Lukas Lacko and Igor Zeleny, while Jamie Delgado and Ken Skupski take on Poles Tomasz Bednarek and Jerzy Janowicz. What burning question would you love to ask Andy Murray? The British number one will be taking part in a Q&A for BBC Sport later this week as he bids for his second Grand Slam title at the Australian Open. If you've got a question for Andy - whether it's on tennis or the trivial - write it in the comment section below and we'll put a selection of them to the man himself.